The bedroom should have a focal point which can distract the view of the people from the slanted wall. 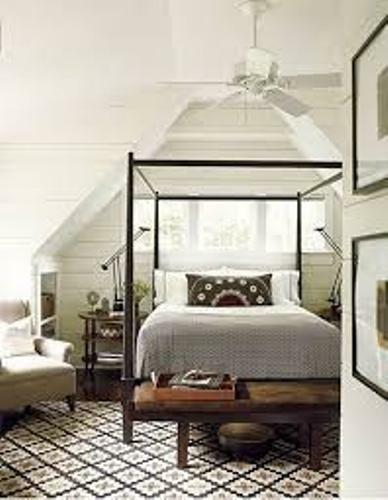 Most people choose their interesting bed frame as the focal point. Choose a unique bed frame. It can be made of hardwood. Paint it in a bold color. It can be in black, red or white tone. The slanted walls in the bedroom should receive simple decorating if you want to hide it from the view of the people. Choose an accent wall which can receive more attention. Thus, the eyes will be focused more to spot the bold colored accent wall than on the simple colored slanted walls. You can choose teal, hot pink, red or black as the accent tone. Select the color based on the interior design of the bedroom. Now decide the complementary furniture pieces to have inside the bedroom. The focal point is located on the bed frame. You can put a small nightstand or a side table next to the bed frame. It can be used to hold glasses, candles or a vase of flowers. 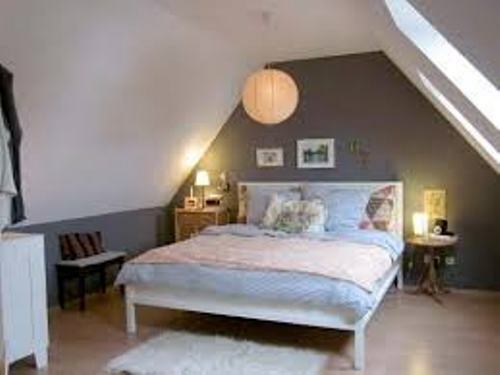 In most cases, the bedroom with slanted walls and ceiling are located in the attic. It will be great if you have windows in the room which can increase the bright and roomy feeling. Use roller blinds if you want to maintain the privacy. Get guides on how to arrange bedroom with a lot of windows here. There are many decorative items that you can apply in the bedroom wall to reduce the odd look of the slanted walls. For instance, you can have a corner chrome finished floor lamp to locate at the corner of the slanted walls. 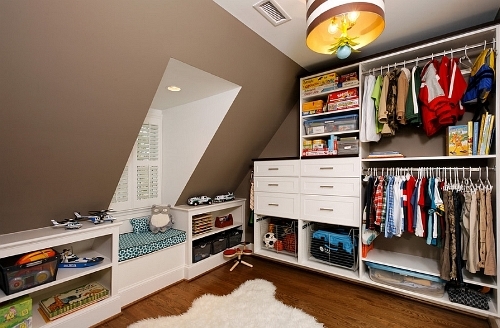 Get ideas on how to arrange bedroom with big furniture here. Are you interested reading tips on how to arrange a bedroom with slanted walls?